Eyewear-designing twins Coco and Breezy have been blowing up since they made the move from Minnesota to NYC. The duo have been featured in everything from Essence to Elle, and count Ashanti, Nicki Minaj, Kelly Osbourne and Kelly Rowland as fans of their sunglasses line. 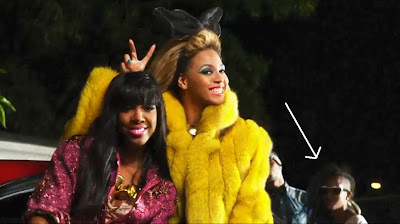 Apparently, their personal style got them noticed by the casting agent for Beyonce's new video for the early '90s R&B throwback jam "Party" (which also features a cameo by Rowland). 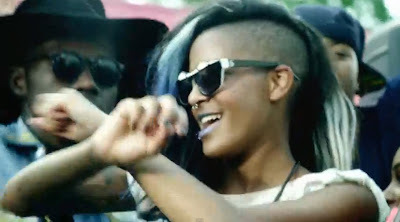 Here are screenshots from the video featuring Coco and/or Breezy, wearing shades from their new "Rainy Days" collection (available now at www.cocoandbreezy.com). Watch the video in full below. Yup, Minneapolis has finally made it. We are famous. No one even notices Beyonce because they're too busy looking at Coco and Breezy, who like you said, couldn't make it until they left Minnesota. I wonder how many blogs in Portland are pointing out former citizens of their city who are also probably extras in this video. I'm guessing none. Because they're all busy making the next big craze to hit the country. While we're all busy talking about those persons we had to point an arrow at to notice. Poignant. Minnesota has to put an arrow in the background to point out our place in national/international pop culture. I see what you guys did there, you made a metaphor. Aw, come on...Coco and Breezy are cute. Does every post have to be serious and impactful to the world? It's gossip blog, not the New York Times.